It is a striking pose, and portrait. An unbelievably young, slim and tranquil-looking Sridevi lounging in the shadow of a giant seated Buddha made of stone, in an idyllic setting. The actress, top to toe in white like the heroine of an ’80s Yash Chopra film, is on a ‘spacation’, as the headline puts it. ‘Spacation’ — never heard this one before: I suppose it was created by combining spa and vacation. And I presume Sridevi went alone to this ‘new haven of wellness’ in Pune. Just like my brother-in-law who has just gone to an ayurvedic resort near Bengaluru — also alone. Something he has never done before. Perhaps going solo is an emerging trend, and not just to wellness resorts, spas or clinics but elsewhere, and everywhere. A friend has been doing this for years. 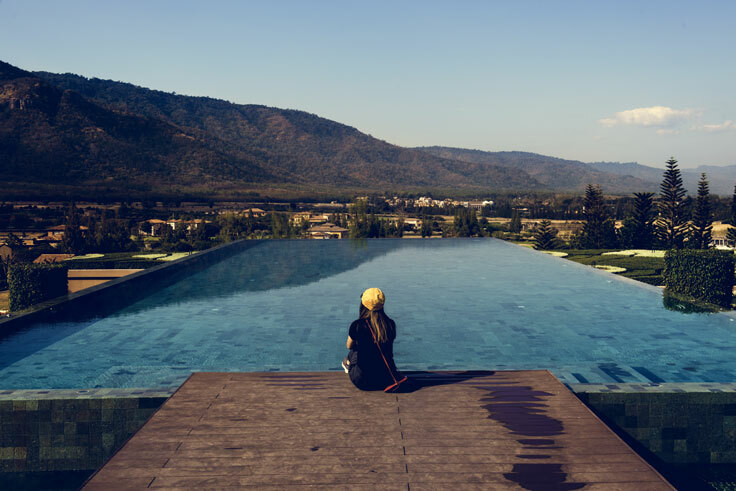 She follows her impulses and indulges in her many whimsies: 10 days learning how to make authentic pasta in Tuscany, soaring in a hot-air balloon over Cappadocia, watching the Day of the Dead celebrations in Mexico…the list is long. Age hasn’t withered her lust for adventure. “Why do you travel alone? Isn’t it lonely,” I ask her. She can strike up a conversation with just about anyone. And in the process find out more about the lay of the land — and its people — than we groupies (voyagers in groups or with family) could in repeated visits. For the more reticent who are not comfortable talking to strangers — even concierges or fellow passengers on trains and in cafes — books can be good travelling companions. My brother-in-law took along two armloads of books to the clinic-resort. Wonder what Sridevi took along? Diet, fitness and grooming books, perhaps. Which reminds me of what psychoanalyst-author Sudhir Kakar once told me when I was writing a piece about loneliness. Stressing the difference between ‘being alone’ and ‘solitude’, he said he enjoyed being by himself because he could, without any distractions or disturbances, have imaginary conversations with philosophers, writers and scholars. No doubt he engaged with Freud and Jung and Rabindranath Tagore. Whether somebody was dead or alive, nearby or in a faraway land or time didn’t matter. He enjoyed the silent exchanges taking place in his head. Would William Wordsworth, the 19th century poet partly responsible for, along with Samuel Taylor Coleridge and others, ushering in English Romanticism (whose poetry all us ‘Eng Lit’ types had to learn by rote), have written such beautiful verses had he walked through the Lake District in the company of chattering friends? Words like: I wandered lonely as a cloud/ That floats on high o’er vales and hills… For oft, when on my couch I lie/In vacant or in pensive mood,/They flash upon that inward eye/Which is the bliss of solitude;/And then my heart with pleasure fills,/And dances with the daffodils. Do mountains, lakes and monuments, even daffodils, speak more willingly to the solitary traveller? Going it alone is for those who are more self-reliant; those who relish their own company and are not uncomfortable eating alone in a restaurant. And yes, who enjoy playing solitaire, like my friend endowed with more than her share of wanderlust. But for many, like me, the company counts: the journey being as important as the destination. And I confess I am uneasy sitting alone in a restaurant: I eat and run. The DNA of group travel is also changing. When air travel became cheaper you began to see large groups with similar dietary restrictions and preferences who ‘do’ Europe or the United States, with their movable feasts of long-lasting theplas or parathas made from dough kneaded with milk. They are not in the least self-conscious while opening up their tiffins in restaurants, and sneakily pulling green chillies from their handbags. Savvy travel agents also began to design customised tours for like-minded travellers. Adventure, culinary pursuits, beaches, mountains, pilgrimages, cruises in the Arctic or Alaska, tours through East Europe and South East Asia — there was choice, beyond the lovely bridges of Paris, Buckingham Palace and Niagara Falls. The self-appointed sophisticates, having ‘done it all’, worked hard to differentiate themselves from the burgeoning herds following in their wake. They turned to the homeland and the countries bordering it: the Northeast, Andaman Islands and neighbouring countries like Myanmar took on exotic tones. Women travelling in groups are hardly breaking news. ‘Hen’ sorties have become bolder: the islands of Thailand, the souks of Marrakesh, and the more challenging terrain of Ladakh and other outposts. The increasingly popular destination is Amritsar for non-Sikhs and people from all parts of the country: a darshan at Harmandir Sahib or the Golden Temple is followed by feasting on the ‘real’ makki ki roti and sarson da saag, stuffed kulchas and chole, bheja fry and diabolically rich lassi in dhabas in the lanes and by-lanes of the city. Spiritual and gastronomical combos make for enduring memories. Having fun is not the only motivating impetus for an increasing number of women on the move the world over, and in India. Travelling to make a point and support a cause is increasing — whether it is for fund-raising marathons in Mumbai or Delhi for various causes from cancer research to promoting awareness about the need for improved women’s healthcare or family planning. There were over 600 women’s marches in various countries against President Donald Trump the day after his inauguration. Women flew in from Europe to participate in those held in Washington DC and New York City. Loitering with intent is the flavour of the day. Perhaps my wanderlust-struck friend will start travelling with an agenda.